Coyote Buttes North may get all the love because it holds the famous Wave formation, but there is another nearby area that has just as fascinating formations and is much easier to get permits for. As you probably know, getting permits to Coyote Buttes North requires a lot of luck and patience. While Coyote Buttes North has exploded in popularity since being included as a background image on Windows PCs, Coyote Buttes South hasn’t enjoyed the same exposure. This is good news for you because it makes it relatively easy to obtain a permit. We will discuss the process of obtaining a permit further down in the article. 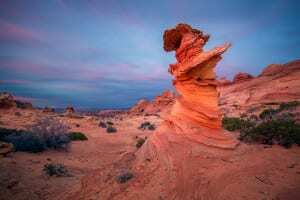 What is there to see in Coyote Buttes South? The Control Tower gets the best light during winter, so don’t be afraid to visit the area year-round. Another advantage of visiting Kanab and the surrounding areas in the winter is that crowds are low and hotel prices are much cheaper! Another fascinating and similar formation is what some call The Witch’s Hat or The Seahorse. I like to imagine The Seahorse surveying his kingdom much like Mufasa and Simba on Pride Rock in The Lion King. You can make up your own mind, but you must go out and see it to truly appreciate it. 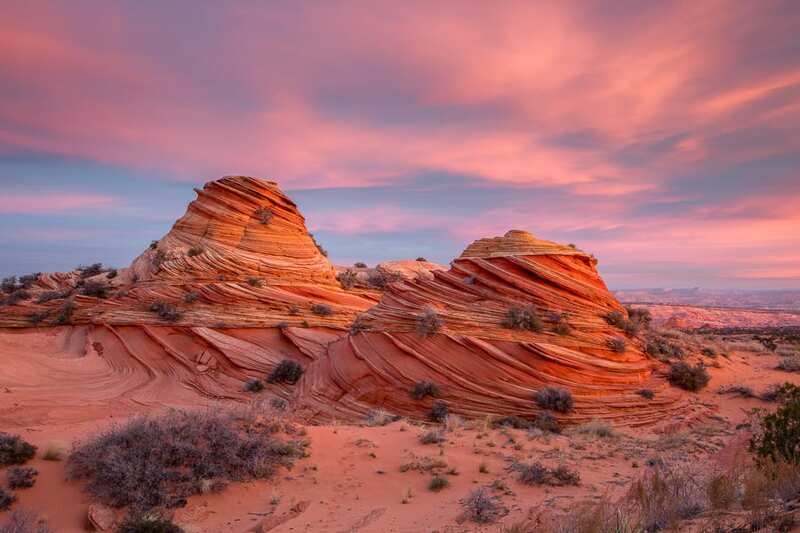 At this point, you might be thinking that all Coyote Buttes South has to offer is a baby imitation of The Wave and some sandstone formations that look like they might blow away in the next strong wind. Let’s take a look at something a little different and not quite so tall. 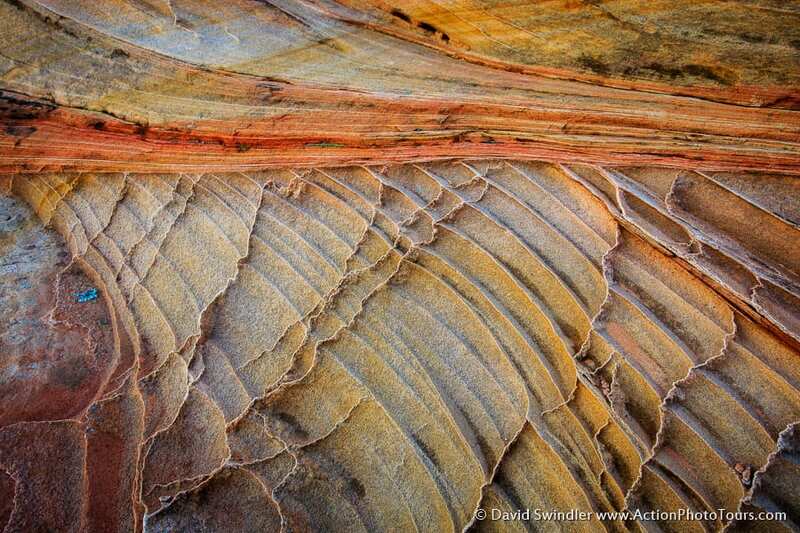 Here we have some beautiful and very delicate sandstone fins and stripes that make for great abstract photographs. Don’t be fooled into thinking that all of your pictures must be of grand sweeping landscapes. Much of the intrigue at Coyote Buttes South comes from the small formations as well, which allows you to be very creative with your shots and expand your photographic horizons. These teepees take some time and effort to get to, but the payoff is the chance to capture images that most people will never have the opportunity to. The morning sunlight reflecting off The South Teepees is a very cool way to start your day if you spend the night out there. So, is The Wave in Coyote Buttes North worth visiting? Of course, it is. It is a once in a lifetime opportunity for most people and a never in a lifetime opportunity for even more. However, it is not the only Coyote Butte worth visiting and I would argue that the South Butte is better because of the vast amount of diversity in its landscape. So, don’t be downtrodden or dismayed if you don’t happen to win a permit for The Wave! 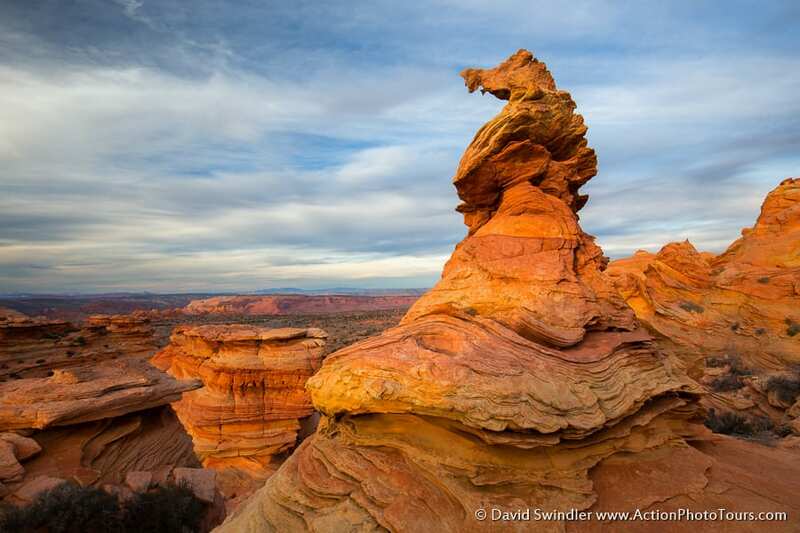 Stick around and grab a permit for Coyote Buttes South and take your time exploring this wonderful scenery. There are many more things to see in the area. These pictures just scratch the surface, so get out there and explore! How do I get a permit for Coyote Buttes South? 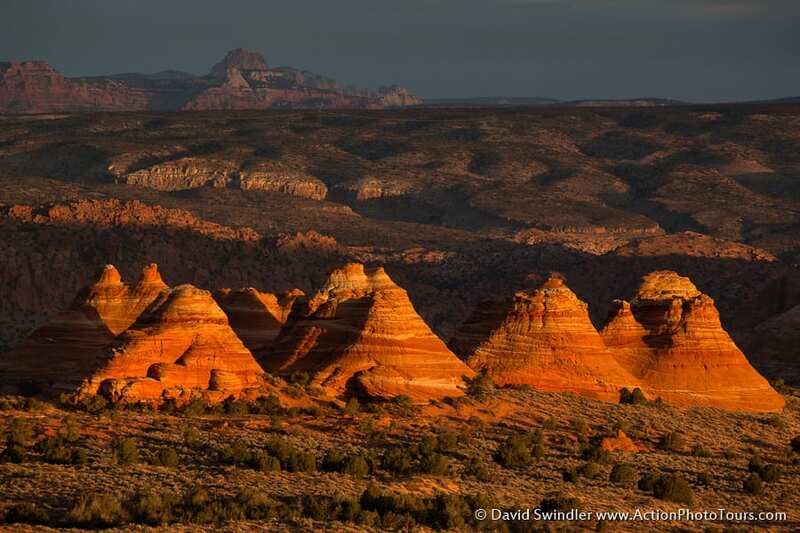 The process for getting a permit to Coyote Buttes South is similar to the process for Coyote Buttes North permits. Getting a permit online is different in that it is not a lottery system, it is first come, first served and you can get them four months in advance. For example, on January 1, the calendar opened for the entire month of April. If you are planning on getting a permit online, you have to get them the day they become available. They only issue 10 online permits per day, so they go quickly. In fact, as I write this it is January 3 and the permits for April are entirely gone. You can apply for online permits here https://www.blm.gov/az/paria/hikingcalendar.cfm?areaid=1. Don’t worry if you don’t manage to get a permit online, because they also have a daily lottery for walk-in permits just like The Wave, except that while hundreds of people are applying for permits to hike The Wave, there are days where they don’t even give out all 10 walk-in permits for Coyote Buttes South! We often attend the walk-in lottery for clients and most days everyone who shows up gets to go! In order to apply for a walk-in permit, you must be at the Kanab BLM Visitor’s Center at 9:45am. The drawing is at 10am and they do not allow late applications. The application is essentially the same as for The Wave and the lottery is identical. (Remember that if you are applying in Winter, you must be there on Friday to get permits for Saturday, Sunday, or Monday). If less than 10 people show up, they don’t do the drawing and will issue permits right on the spot. It’s also worth asking if there are any same-day permits available. One service we provide here at Action Photo Tours is to apply for walk-in permits on your behalf. We can do this for Coyote Buttes North or South, so rather than wasting your sunrise hours waiting apply for a permit, we can free you up to visit other intriguing areas while we take care of the boring stuff. After you win a permit, we would love to take you out on an eight hour tour to show you all of the spots we love and shoot a beautiful sunset together. 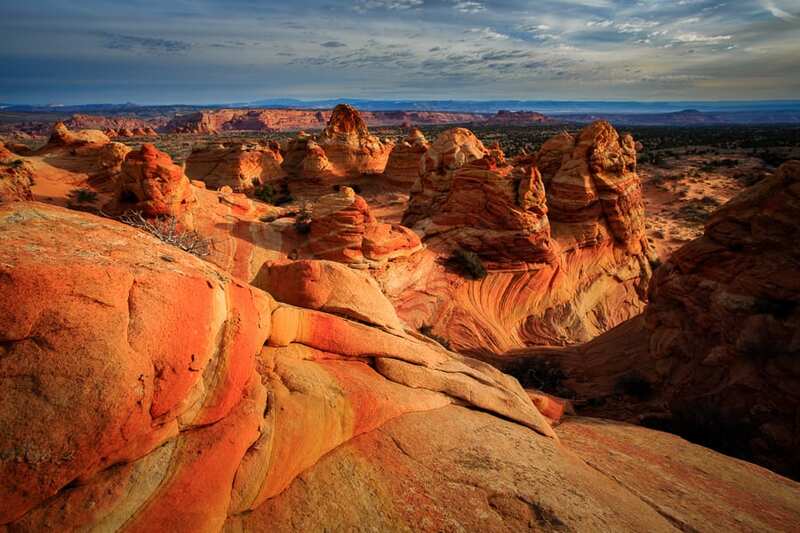 Here are some more details for our tours to Coyote Buttes South and Coyote Buttes North.